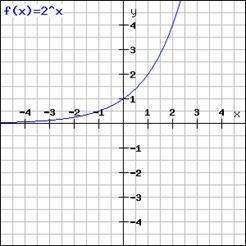 Exponential functions are one of the most important classes of functions in mathematics. We use these functions to calculate interest on investments, growth and decline rates of populations, forensics investigations and many more applications. An exponential function is a function of y=ax where a > 0 and x is a real number. The domain of ax consists of all real numbers, and the range is from 0 to infinity. 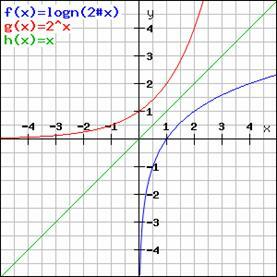 Note that at x = 0, a0 = 1, so the exponential curve will cut the y-axis at y = 1. Also note that the exponential functions are one to one functions. The following table shows exponential growth in the number of daughter cells. As you can see that the number of daughter cells increases exponentially with an increase in the number of parent cells. If the number of parent cells is x, then the number of daughter cells is 2x. If we need to calculate the number of parent cells, i.e. x from the number of daughter cells and y, we need to use the inverse of the exponential operation. The following diagram shows a graph of both the exponential and logarithmic graphs. If you observe carefully, both the exponential and logarithmic graphs are reflections of each other about the line y=x. 1. The following graph shows two functions, A and B. Which of the following is not true? A is the exponential growth function. B is a logarithmic function. Graph A is a reflection of graph B about y=x. 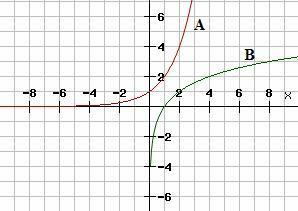 Graph A is a reflection of graph B about y=-x.